Jesse was waiting in his wheelchair. 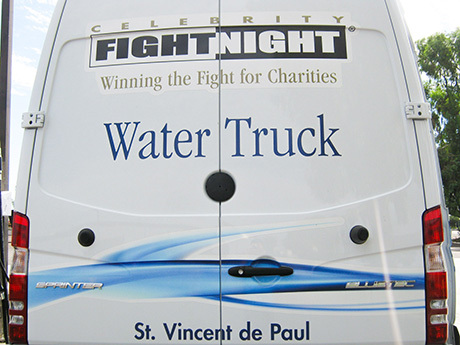 His eyes lit up as the St. Vincent de Paul Celebrity Fight Night Water Truck drove up at 5 a.m. It was going to be in the triple digits that day, but relief had arrived. Jesse’s address is the corner of 11th Avenue and Madison Street, Phoenix, Arizona. There is no house at this address, but this is Jesse’s home. Joseph and Jose, SVdP’s full-time water truck drivers, visit him often. In fact, Joseph and Jose visit hundreds of homeless individuals every week at their ‘homes.’ The mission of St. Vincent de Paul has always been to offer person-to-person service to those in need. One way we do this is through our home visits, where volunteers bring a box of food to a home in need. 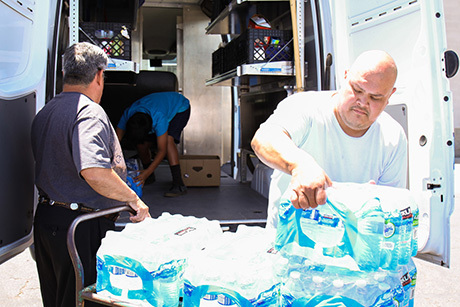 A few years ago, our friends at Celebrity Fight Night Foundation helped us take this home visit one step further by donating a water truck, to ensure homeless individuals who are too far away or unable to travel, could still receive necessary resources. And in Arizona, one of the most valuable resources is water. Jose and Joseph, who have both worked for SVdP for many years, were brought in to pilot this new program. And after a year, both felt they were called to this special outreach. A typical day for them starts at 5 a.m., as they head to SVdP to pick up pallets of water, food, and boxes of pre-donated items, such as clothing and toiletries. Delivering all throughout Maricopa county, they split the route into four regions and select a different region each day. 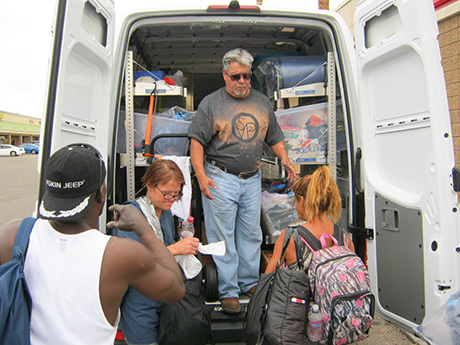 Throughout the day, they drive to several different homeless encampments and areas where many have made their ‘homes.’ In addition to water, Joseph and Jose hand out sack lunches, toiletries, backpacks, clothing, biblical readings and directories of resources. Ten hours later, as they finish up their day, all the items are gone. Joseph and Jose typically work five days a week, but during the summer, when temperatures hit triple digits, they run the truck seven days a week. In just one year, both have seen several individuals past the point of dehydration, and sadly, even many who have passed away. The truck can be found making its way through parks, canals, bus stops, deserted development areas, and even in rural mountainous areas. They go where the need is…and the need is great. As high-summer temperatures continue well into September, Joseph and Jose will continue their efforts to keep the most vulnerable hydrated, fed and most importantly, let them know that someone cares. “When it comes to helping others, the most important thing is learning how to use your heart,” says Joseph. Throughout the month of June, CBS 5 and Papa Murphy's Take 'N' Bake Pizza have teamed up to support our Summer Action Hero campaign, aimed at raising awareness and support for community members who are most vulnerable during the hot summer months. Bring in canned donations to any Arizona Papa Murphy's location for $3 off your pizza order. If you can't make it to a store, you can donate online today.